Loft Bed System. Beautiful Design. Custom Made Solid Wood Loft Bed. The quoted price is for the bed to be made in Pine and Birch. Can be made of Oak or Maple at extra cost. Available finished or unfinished. Includes Top Twin Size Bed with 3-Drawers Ar moire, 2-Doors, 2-Adjustable Shelves behind Doors, Desk 4-Drawers and Hutch with Adjustable Shelves. Free Standing Ladder, all Drawers on Metal Glides. Can be made of Pine, Oak, Maple or Birch wood. Available finished or unfinished. The Ladder is movable. Easy to assemble. Strong construction. Custom Size is also available. Mattress is not included in the price.Twin Size: 42 In. (W) x 79 In. (L) x 69 In. (H)Hand Crafted In The USAWood Type Information Click Here*Local Delivery Or Store Pick Up Only. Click Here For Delivery Areas. Jr. Loft Bunk Bed. Price includes the Bed as shown in the picture. Jr. Loft Bed with Bottom Bed on Wheels. Beautiful Design. Colors can be mixed and matched or Solid Color as you like. Please see color chart for available colors. Strong Construction. Made of Melamine or Solid Birch Wood. This Wardrobe Is Also Available In Custom Size. If You Would Like A Particular Size, Please Indicate The Size In The Shipping Comments Box Or Contact Us Via Email Or Telephone. This Jr. Loft Bed Is Shipped Fully Assembled.Twin Loft Bed 75 In.W x 4 In.D x 15 In.H More Dimensions: complete bed dimensions: 42.75 In.W x 96.5 In.D x 43.25 In.H Storage Steps w/Loft Ends 16 In.W x 15 In.D x 34 In.H Twin Loft Caster Bed 75 In.W x 42 In.D x 16 In.H *Local Delivery Or Store Pick Up Only. Click Here For Delivery Areas.Hand Crafted In The USA Normally Takes A Week To Make. Custom Made Twin Size Loft Bed With Staircase. Underneath The Loft Is A Wardrobe, Small Pull Out Desk With 3-Drawers & 3-Adjustable Shelves And A Desk With Keyboard & Hutch. Custom Made Twin Loft Bed With Stairs. Beautiful Design. Features A Twin Bed, Twin Trundle, Staircase With Drawers And 8-Drawers Underneath The Bed. Custom Made Loft Bed With Staircase. Beautiful Design. 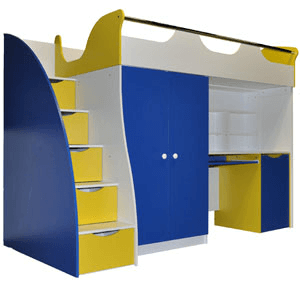 Features Include Twin Size Top And Bottom Beds And Three Under-bed Drawers. Bottom Bed Is Also Available In Full Size. Colors can be mixed and matched or Solid Color as you like. Please see color chart for available colors. Strong Construction. Made of Melamine. This Loft Bed Is Also Available In Custom Size. If You Would Like A Particular Size, Please Indicate The Size In The Shipping Comments Box Or Contact Us Via Email Or Telephone. This Loft Bed Is Shipped Fully Assembled.Dimensions:Twin/Twin: 93 In. x 48 In. x 58 In. (H)Twin/Full: 93 In. x 62 In. x 58 In. (H)*Local Delivery Or Store Pick Up Only. Click Here For Delivery Areas. Click Here For Color ChartHand Crafted In The USANormally Takes A Week To Build. Custom Made Twin Over Full Loft Bed With Stairs And Drawers. Beautiful Design. Colors can be mixed and matched or Solid Color as you like. Please see color chart for available colors. Strong Construction. Made of Melamine. This Loft Bed Is Also Available In Custom Size. If You Would Like A Particular Size, Please Indicate The Size In The Shipping Comments Box Or Contact Us Via Email Or Telephone. This Loft Bed Is Shipped Fully Assembled.Dimensions: 93 In. x 85 In. x 58 In. (H)*Local Delivery Or Store Pick Up Only. Click Here For Delivery Areas. Click Here For Color ChartHand Crafted In The USANormally Takes A Week To Build. Custom Made Loft Bed With Staircase And Trundle. Beautiful Design. Bed Is Available Twin/Twin Or Twin/Full With A Twin Or Full Size Trundle. Colors can be mixed and matched or Solid Color as you like. Please see color chart for available colors. Strong Construction. Made of Melamine. This Loft Bed Is Also Available In Custom Size. If You Would Like A Particular Size, Please Indicate The Size In The Shipping Comments Box Or Contact Us Via Email Or Telephone. This Loft Bed Is Shipped Fully Assembled.Dimensions:Twin/Twin: 93 In. x 48 In. x 58 In. (H)Full/Full: 93 In. x 62 In. x 93 In. (H)*Local Delivery Or Store Pick Up Only. Click Here For Delivery Areas. Click Here For Color ChartHand Crafted In The USANormally Takes A Week To Build. Custom Made Loft Bed as shown. Beautiful Design. Colors can be mixed and matched or Solid Color as you like. Please see color chart for available colors. Strong Construction. Made of Melamine or Solid Birch Wood. This Wardrobe Is Also Available In Custom Size. If You Would Like A Particular Size, Please Indicate The Size In The Shipping Comments Box Or Contact Us Via Email Or Telephone. This Loft Bed Is Shipped Fully Assembled.Size: 96 In.(W). x 76 In. (D) *Local Delivery Or Store Pick Up Only. Click Here For Delivery Areas.Hand Crafted In The USA Normally Takes A Week To Make. Custom Made Twin on Top Full Size on the bottom Loft Bed as shown. Beautiful Design. Colors can be mixed and matched or Solid Color as you like. Please see color chart for available colors. Strong Construction. Made of Melamine or Solid Birch Wood. This Wardrobe Is Also Available In Custom Size. If You Would Like A Particular Size, Please Indicate The Size In The Shipping Comments Box Or Contact Us Via Email Or Telephone. This Loft Bed Is Shipped Fully Assembled.Size: 96 In.(W). x 76 In. (D) *Local Delivery Or Store Pick Up Only. Click Here For Delivery Areas.Hand Crafted In The USA Normally Takes A Week To Make. Custom Made Loft Bed as shown. Beautiful Design. Colors can be mixed and matched or Solid Color as you like. Please see color chart for available colors. Strong Construction. Made of Melamine or Solid Birch Wood. This Wardrobe Is Also Available In Custom Size. If You Would Like A Particular Size, Please Indicate The Size In The Shipping Comments Box Or Contact Us Via Email Or Telephone. This Loft Bed Is Shipped Fully Assembled.Size: 96 In.(W). x 48 In. (D) *Local Delivery Or Store Pick Up Only. Click Here For Delivery Areas.Hand Crafted In The USA Normally Takes A Week To Make. Custom Made Twin on Top Full on the bottom Loft Bed as shown without the mattress and bedding. Beautiful Design. Colors can be mixed and matched or Solid Color as you like. Please see color chart for available colors. Strong Construction. Made of Melamine or Solid Birch Wood. This Loft Bed Is Also Available In Custom Size. If You Would Like A Particular Size, Please Indicate The Size In The Shipping Comments Box Or Contact Us Via Email Or Telephone. This Loft Bed Is Shipped Fully Assembled.Size: 96 In.(W). x 80 In. (D) *Local Delivery Or Store Pick Up Only. Click Here For Delivery Areas.Hand Crafted In The USA Normally Takes A Week To Make. Custom Made Twin/Twin Loft Bed as shown. Also available with Full Size Bed on the bottom at extra cost. Beautiful Design. Colors can be mixed and matched or Solid Color as you like. Please see color chart for available colors. Strong Construction. Made of Melamine. This Wardrobe Is Also Available In Custom Sizes. If You Would Like A Particular Size, Please Indicate The Size In The Shipping Comments Box Or Contact Us Via Email Or Telephone. This Loft Bed Is Shipped Fully Assembled.Size: 32 In.(W). x 21 In.(D). x 80 In.(H). *Local Delivery Or Store Pick Up Only. Click Here For Delivery Areas. Click Here For Color ChartHand Crafted In The USANormally Takes A Week To Build. Custom Made Twin Size Loft Bed as shown. Beautiful Design. Colors can be mixed and matched or Solid Color as you like. Please see color chart for available colors. Strong Construction. Made of Melamine. This Loft Bed Is Also Available In Custom Sizes. If You Would Like A Particular Size, Please Indicate The Size In The Shipping Comments Box Or Contact Us Via Email Or Telephone. This Wardrobe Is Shipped Fully Assembled.Size: 32 In.(W). x 21 In.(D). x 80 In.(H). *Local Delivery Or Store Pick Up Only. Click Here For Delivery Areas. Click Here For Color ChartHand Crafted In The USANormally Takes A Week To Build. Custom Made Twin Loft Bed as shown. Also available with a twin size pull out bed, at extra cost. Beautiful Design. Colors can be mixed and matched or Solid Color as you like. Please see color chart for available colors. Strong Construction. Made of Melamine. This Wardrobe Is Also Available In Custom Sizes. If You Would Like A Particular Size, Please Indicate The Size In The Shipping Comments Box Or Contact Us Via Email Or Telephone. This Wardrobe Is Shipped Fully Assembled.Size: 32 In.(W). x 21 In.(D). x 80 In.(H). *Local Delivery Or Store Pick Up Only. Click Here For Delivery Areas. Click Here For Color ChartHand Crafted In The USANormally Takes A Week To Build.